Gwen Healey was born and raised in Iqaluit, Nunavut where she continues to work and live with her family. Gwen is the Executive and Scientific Director of the Qaujigiartiit Health Research Centre (AHRN-NU) in Iqaluit, NU. Canadian northerners face a number of challenging circumstances when it comes to health, but there are also tremendous strengths in communities to address local health concerns, such as a willingness to work together, traditions and customs that support healthy lifestyles and activity, and strong cultural pride. Drawing upon existing community strengths and resources, and building capacity to conduct research in the North, is the key to addressing a number of health concerns presently and over the coming years. For this reason, Gwen founded the Qaujigiartiit Health Research Centre (AHRN-NU). The goal of Qaujigiartiit is to enable health research to be conducted locally, by Nunavummiut, in a supportive, safe, culturally-sensitive and ethical environment. 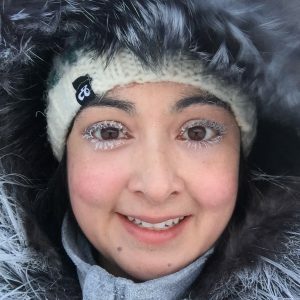 The Centre promotes a model in which Inuit Qaujimajatuangit and western science knowledge are incorporated into initiatives that address health concerns, create healthy environments, and improve the health of Nunavummiut.